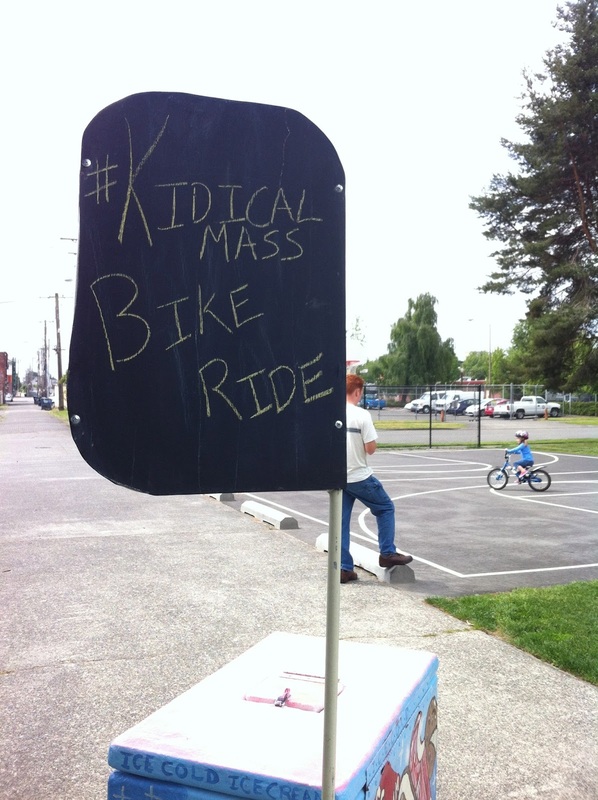 We had another great turnout for Kidical Mass Tacoma #2. After some bike fitting and decorating, we toured the neighborhood with five or six families. Two parents even jogged along with the group, which wasn't difficult at our kid-bike pace. Our youngest rider was just 3 years old, but we all stayed together and rode as a group. We rode in the street from Peoples Park to McCarver Park (also know as Zina's Place) with a loop around Ferry Park on the way. (Did you know that Ferry is Tacoma's oldest park? 1883!) All three of these Hilltop parks have great playgrounds and lots of open space to run and ride around. After a short break at McCarver, we took a more direct route back to Peoples Park, taking advantage of the one-way streets through the neighborhood. Crossing South 19th Street was the only difficulty, but courteous drivers helped us manage it safely. Thank you Kris, Peter, and Betsy for volunteering as crossing guards. Jeff's Ice Cream had frozen treats for our riders at the finish, courtesy of a few anonymous snack sponsors. Thank you, Sponsors! Made In Washington ice cream is the best. It was great to chat with other parents about family cycling in Tacoma and brainstorm future Kidical Mass events. If you have questions, comments, or feedback about the rides, please share a note below or email us. We're having fun and looking forward to sharing the lane with kids again soon. Where should we go? Destination, route, theme? Maybe the East Side or South Tacoma? We'll announce details at the July ride and here on the blog. Mark your calendar! We'll be gathering kids to ride a portion of the Sunday Parkways route that will connect the downtown waterfront to Point Defiance Park. This is a huge event organized by the City of Tacoma and you won't want to miss it.